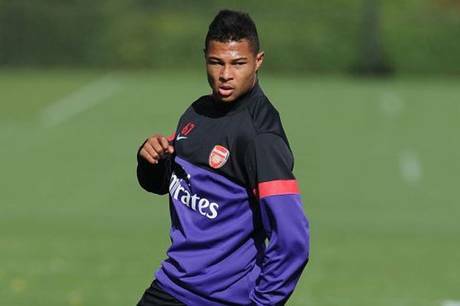 Serge Gnabry is earning huge praise after a string of impressive performances now. Arsenal and Chelsea made sure all English sides had a 100% record after matchday one of the UEFA Youth League. In the inaugural edition of the tournament, of which the first round of group games took place on Tuesday and Wednesday, Arsenal beat Marseille 4-1 and Chelsea beat Basel 4-0. Alex Iwobi opened Arsenal’s account before Thomas Ephestion equalised for the French side. Serge Gnabry, who is tipped to be one of the players of the tournament, then scored a brace and Jack Jebb netted the fourth after Kristopher Olsson’s free-kick wasn’t held properly. Chelsea netted their first through a Deni Kadoic own goal before John Swift, Islam Feruz and Alex Kiwomya all got on the scoresheet to complete the rout. The most shocking result of the night came in Group G as Austria Wien beat Porto 3-0. Nikola Zivotic, Dominik Prokop and Peter Michori scored for Wien. “Our boys showed great team spirit, motivation, discipline and will to win,” said Austria Wien coach Herbert Gager. Elsewhere in Group G, Atletico Madrid and Zenit played out a six-goal thriller. Borja Martínez, Jony, Ivi and Iván Calero put Madrid 4-0 up before Zenit launched a great comeback with goals from Artem Simonyan and Aleksei Gasilin but there wasn’t enough time for them to save a point from the match. Flippo Inzaghi’s AC Milan side beat Celtic 3-1 as Marco Pinato netted a brace. Jamie Lindsay replied for the Scottish side but Krisztian Tamas restored the two goal advantage. “Pinato is a very important weapon. I knew I could count on these boys. I am delighted with their success.” said Inzaghi after the game. In Group C, Olympiakos and Paris St Germain played out a goalless draw with Devon Romil having the best chance for the French side. Steaua Bucharest went down 3-0 to Schalke with goals from Daniel Koseler, Adis Omerbasic and Maurice Multhaup. Napoli beat Dortmund by a single goal from Gennaro Tutino in Arsenal’s group. Check out our HUGE preview for all the latest stats on the side’s involved.